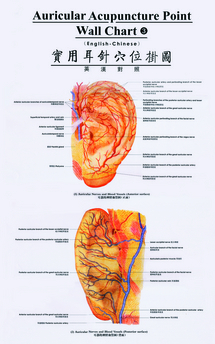 This full color Chinese auricular acupuncture point chart set includes auricular points, surface anatomy of the ear, blood vessels, and innervations. 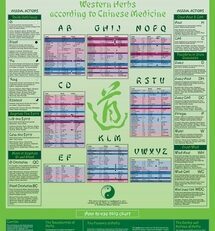 Charts contain English and traditional Chinese characters; alphanumeric codes and Chinese are included for the standard auricle divisions. 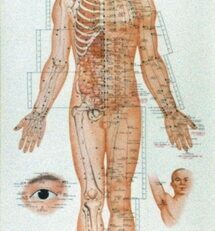 Excellent resource for teachers, students, and as a clinical reference. 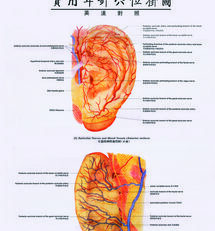 These charts are printed on high-quality clay coated paper stock for durability. Though folded, they are not creased, and thus are easily mounted on the wall using the accompanying hangers and brackets.